Healthcare Gamification Market size was over USD 16 billion in 2016, with an expected forecast of over 12% CAGR from 2017 to 2024. 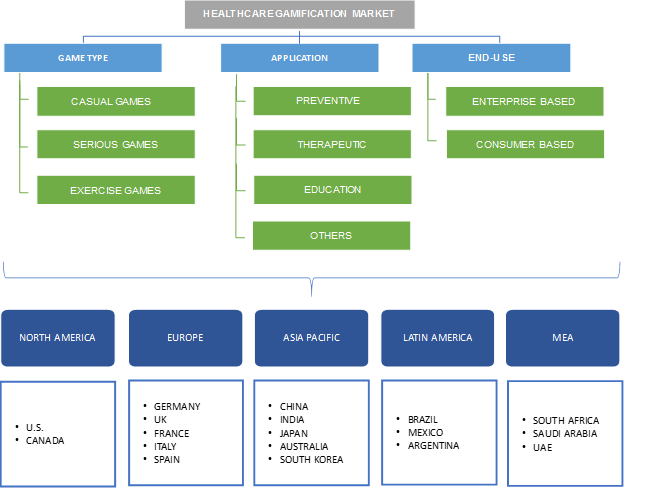 Healthcare gamification market is expected to witness significant growth due to growing acceptance of gamified models throughout the healthcare system. Rising prevalence of chronic diseases and emergence of health consumerism has resulted in a higher demand for the technology. Increasing incidence of chronic disorders and rising shift to business-to-consumer model and outcomes-based medicine should serve as a high impact rendering aspect. Demographic shift toward millennials should increase the adoption rate. Development of strategies like optimizing employee health & performance through targeted, strategic, and value-added interventions coupled with technological advancements and improvement in design, graphics and user-friendliness will boost the product demand. Furthermore, increasing number of smartphone users in developed and developing countries should escalate the business size. Growing indispensable technology use through mobile devices by physicians, patients, and insurers to access, share and receive information will drive the healthcare gamification market. High number of wellness and medical apps downloads to track and monitor health, receive updates on medical developments, easily communicate with doctors and insurers should propel the industry revenue. Low motivation and research in actual game design on the behavioral result and high cost related with some games may limit business growth to some extent. Moreover, gamification seems to work best in achieving short term and smaller goals rather than long term eventually leading to low business demand. Casual games market includes easy and fun games that are played across platforms for therapy and monitoring. Serious games constitute of gaming applications used for education, training, and performance improvement. Exercise games comprises of fitness and interactive physical motion games. Casual games will grow at a significant rate pertaining to increasing influence on patient behavior, particularly behavior surrounding adherence and cognitive health. Disease prevention applications are projected to witness vigorous growth due to increase in number of players competing for fitness and encouraging the expansion of several apps that compare performances. Increasing use of gaming in the training of medical doctors will further increase the demand. Development of games that rewards individuals for sticking to medicine regimens will propel the industry share. Increasing awareness towards health and growing use of games for disease monitoring and brain health will encourage adoption. Enterprise based segment held the major revenue share in 2016 due to increased awareness towards employee health and companies hosting walking competitions. Offering wrist worn activity trackers like Fitbits to employees will boost the enterprise based healthcare gamification market. Rising use of game scores as basis for contests on game trackers for fitness rewards, cash incentives driving competitive dieting in the workplace will boost the business share. China healthcare gamification market accounted for substantial revenue share due to increasing shift from disease-curing to disease prevention approach and early diagnosis. Lack of skilled professionals, overcrowding and poor access to hospitals will drive healthcare gamification market. Japan healthcare gamification market will witness robust growth owing to mounting use of games to improve health behaviors and supporting the delivery of care. Moreover, growing fitness needs, increasing incidence of chronic diseases, infrastructure developments, and treatment advances should surge the regional revenue share. South Africa is forecast to witness a robust growth pertaining to increasing need for healthcare services to meet the demand and reducing the high cost of services. Rising use of gamification for HIV and Ebola prevention will propel the industry growth. Some of the prominent industry players are Fitbit, Ayogo Health, Microsoft, Bunchball, Akili Interactive labs, EveryMove, Hubbub Health, JawBone, Mango Health, and Nike. The industry participants adopt various strategies such as investments, new product development and technological advancement to expand their market position and product portfolio. For instance, in March 2017, Mango Health, announced a strategic investment from Express Scripts, wherein clients have access to mobile apps by Mango Health, which allows users to track their habits, medications and boost medication adherence through raffles for rewards. Healthcare gamification industry is extremely competitive and has amplified sensitivity towards the introduction of new products for prevention and medical adherence. The industry participants are engaged in development of new games for brain. Technological development is aiding industry expansion. Middle East and African countries provide a profitable future opportunity owing to the shifting perception towards health awareness and growing mobile usage levels.